"The girl loved bees... precious and clever in their fabulous velvet coats, yellow boots and tiny feet dusted with the souls of million flowers." 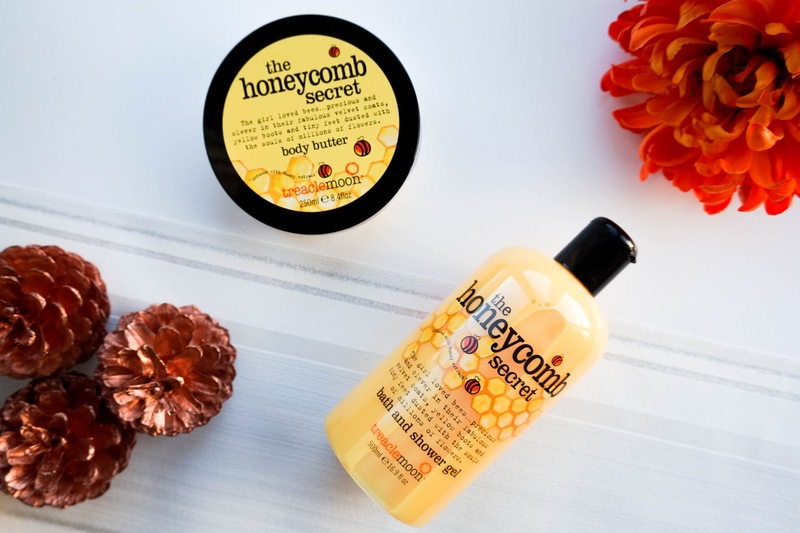 If you've been reading my blog for a while now, you will know that I am a complete sucker for sweet smelling scents so when I was introduced to the Treaclemoon Honeycomb Secret* range, I couldn't wait to try out the products. Cold winter evenings definitely deserve a little bit of this sweet honey scent, which is perfect for a body pampering treat. I've never tried Treaclemoon as a brand until now, which I am definitely surprised about after seeing the amount of gorgeous scents available (clearly I've been living under a rock). I've had this duo for over a week now & I have to say it's been the perfect comforting treat for my skin. If you're like me unaware of the brand, let me introduce you to it a bit better... so basically Treaclemoon is an independent UK brand, which was launched in 2007 but is now sold in countries all over the world. Its popularity means that the brand will be celebrating their production of its 20 millionth bottle by next year (that's a lot of shower gel). The brand focus on being that little bit different with their products and always put their customers first, which I think is fantastic. First of all I love the packaging... colourful, bright yet simple and straight to the point. I also love the fact that the shower gel is a generous 500ml sized bottle, because in my house it's always a product that we seems to go through super fast. 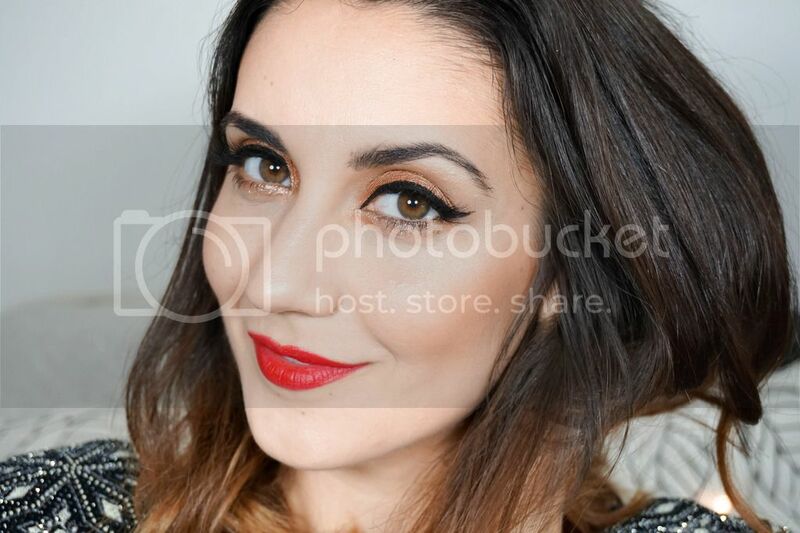 What I love most about the brand is the fact that they are paraben free and not tested on animals, which is always good to know. Their motto is to believe that "true beauty comes from the heart" as they focus on creating products which will leave our skin feeling wonderful. Did I also mention that they are super affordable and easily accessible to everyone, for example you can snap up this range at the minute in your local Tesco on special offer. Lets start off with the Treaclemoon Honeycomb Secret Bath & Shower Gel, which is definitely my favourite of the two. This gel is infused with honey extract so it immediately makes a sweet smelling impact as soon as you pour a little bit out. The scent is sweet there's no denying that but for me personally it doesn't feel over sweet in that sickly kind of way. I really like that it can be used as bath bubbles also, since winter is my favourite time to soak in the bath at least once a week and this leaves my skin super smooth. I'm really enjoying this perfect winter scent and I can't wait to try different scents once I run out because I'm definitely hooked. 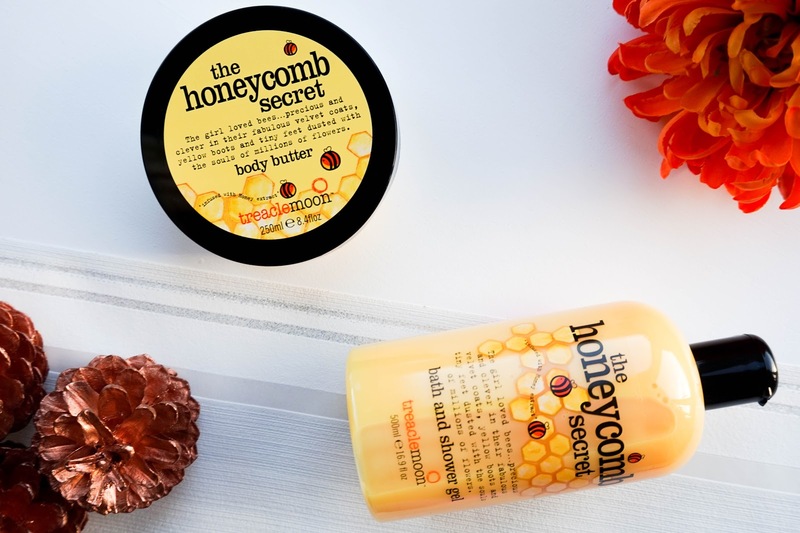 Last up I've got the Treaclemoon Honeycomb Secret Body Butter to keep my skin soft and moisturised. When it comes to body butters I always worry that they will tend to feel too heavy and greasy on my skin, but this option is actually quite lightweight. It's absorbed into my skin immediately and I am left with a sweet smelling scent. My only problem would be that I don't moisturise my body often enough to get use of out this regularly but that my own fault (lazy girl problems). I've also discovered that Treaclemoon have recently launched their #BEYOU project, which means they are officially sponsoring charity BulliesOut to offer help and information to any individual suffering with bullying and going through a hard time. Knowing the effects today's society has on everyone and just how harsh the social media can be at times, I think this is amazing. It's probably the first I have seen from a brand to stand up for something like this in the hope that they can help someone else to feel free and be themselves. Speaking from personal issues I know how easy it is to loose sight of what makes us special, because it's all to easy to feel under pressure and constantly compare yourself to others. So I really think this project is such a great way to raise awareness to such an important issue (big thumbs up from me with this one). So on that note I will end the post before I get any more personal than needs be, but I would love to find out if you've tried the brand before? If you have what's your favourite scent?